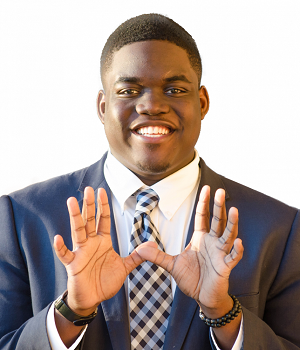 Rice University Student Body President Justin Onwenu was born in Detroit, grew up in Alabama and moved around a lot as a kid. He lived in rural, suburban, and urban Alabama with his mom. His moving around didn’t bother him; in fact it was quite the opposite. He says it was instrumental in learning a sense of how to coexist and feel others’ perspectives. He was a very successful high school student active in debate, basketball, and student government. When he graduated, he knew exactly what he wanted: a small school in a big city. Rice University was the perfect fit. Justin had never been to Houston before his college visit to Rice, but once he saw the vibrant, diverse city, he knew it was the place for him—so much so, it was the only school to which he applied. Justin just knew it was what he must do, he had no Plan B. Justin chose Rice, in part, because of its research and extracurricular activities. Upon arrival, he knew he wanted to study medicine, policy, and international health. There was only one problem: Rice University didn’t have that degree. Justin decided to create his own degree plan. He formulated the curriculum and the class requirements, submitted it to Rice, and created the Bachelor of Arts Degree in International Health and Policy at Rice University. In his sophomore year, Justin became involved in student government and was instrumental in the university’s first-ever student survey to gauge sexual conduct on campus. Justin felt strongly that a dialogue was necessary for students to discuss their expectations with their peers, not just be pushed to know right from wrong. As a result of Justin’s work, Rice University led the nation with the first Critical Thinking and Sexuality course required of entering freshmen. Other college campuses are now following Rice’s lead and engaging in real talk about campus sexual conduct. Justin recently shared his work with Congress when he testified at my ‘‘Breaking the Silence: Responding to Sexual Assault on Campus’’ Field Hearing. He says he knew from the beginning this was such an important topic, he just had to give a voice to it. He had no choice. Then Hurricane Harvey hit. Every Houstonian struggled to know how to respond to this devastating crisis. Justin knew he had to be involved with the school’s Crisis Management Team, so he said he invited himself to their meeting. With this in mind, the student government partnered with the Doerr Institute and the Center for Civic Leadership to create the Rice Harvey Action Team. The R-HAT, made up of 1,700 students and faculty, worked with synagogues, churches, and local shelters on demolition and volunteer projects. ‘‘There was no other option,’’ Justin told me. ‘‘We had to make it happen.’’ There was no Plan B. With finals and term papers now due, Justin has taken on a new civic engagement project: scholarship reform. You may have seen Justin’s op-ed piece in the New York Times late last year on this very subject. Financial aid recipients who receive private scholarships are required to report the amount to their college or university. The school may then evaluate the scholarship and decrease the recipient’s financial aid by the same amount. Since his op-ed, students and student governments from across the nation have reached out to him asking advice and thanking him for giving this issue a voice. Justin visited Capitol Hill this year to tell lawmakers about scholarship displacement and to propose policy changes. Justin is committed to educating lawmakers on this issue; there is no other choice for him. Again, no Plan B. Justin graduates this month. He looks back on his career at Rice and says he’s proud that people who don’t normally speak up, speak with him. He says people have told him he’s their ‘‘voice’’ on issues they care about, but have never felt comfortable coming forward on. He says this has inspired him to continue to speak up and speak out for people and policy changes. Justin Onwenu works on his ‘‘Plan As.’’ And, he finds a way to make them work every time. Justin has never thought about a Plan B, in fact, in his 21 years it’s never entered his mind that one should exist.